Content: Nothing objectionable, but a working knowledge of Regeny manners is helpful. It’s in the YA section (grades 6-8) of the bookstore. Set a year after Keeping the Castle (but you don’t need to read that one first), the Winthrop Hopkins Female Academy has one purpose: to educate young ladies to make smashing matches. The problem, however, is that in Lesser Hoo, Yorkshire, there is exactly one bachelor, who isn’t exactly everyone’s idea of eligible. How are eight young women supposed to find their matches if there isn’t any eligible young men around? 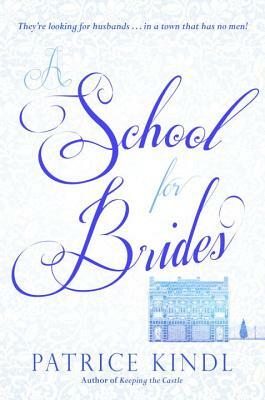 Thus begins the very charming A School for Brides (which was a delight to listen to). Things begin to look up when a young man breaks his leg while in the country and is put up at the school to heal. His friends come calling, and suddenly everything is looking a lot more complicated. Several of the girls are simply delightful (plus the instructor, Miss Quince; I adored her), being that excellent cross between feminist and historical, saucy and authentic. There were so many delightful characters (though sometimes I wished I was reading it so I could keep track of who was who) doing so many delightful things. There were also ones to loathe, so it wasn’t a perfect froth. Amato was also delightful, capturing the spirit of the book in her narration as well as the essence of each character, which is a trick since there’s so many. It’s definitely a fun read.